RHOS – Lloyds Ironstone Co., Corby & Glendon Quarries, Northants. Delivered new on 15th January 1918, this loco was a second generation of Corby locomotives which were required as the quarrying there became more distant and mechanised, ousting small locomotives like our own VIGILANT. RHOS was subsequently numbered No.39 in the Corby fleet, an identity it retained until the end of its career. RHOS was transfered to the nearby Glendon East quarries in January 1952 where it would have worked alongside another locomotive in our collection, HOLWELL No.14. Reverting to Corby in 1957, it holds the distinction of being the last steam locomotive to have received a full overhaul in Corby Works. That this was thorough is demonstrated by the casting of three wheel centres to replace worn out components. Later service at Corby was characterised by dumpcar overburden service and tool van trip working. RHOS headed an Industrial Railway Society visit to Cory in the late 1960’s. 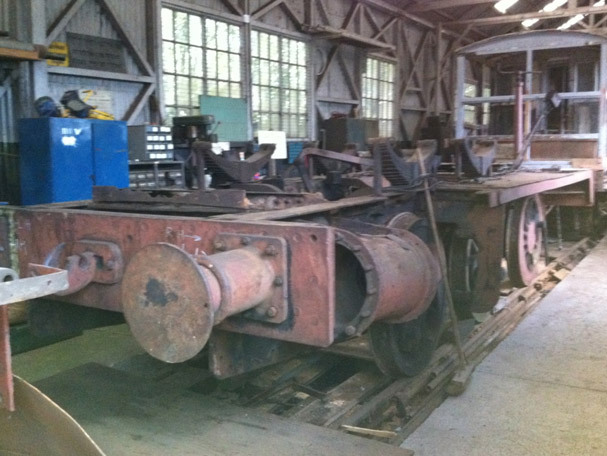 The loco was recently purchased by the “1308 Trust” made up of charity members specifically to preserve and restore RHOS and it is intended that the loco will join the operational large loco fleet at Cottesmore in due course.